Arthur Robert Ashe Jr. was born in July 1943 in Richmond, Virginia. Ashe spent his childhood with his mother at home who taught him to read at an early age. His father was a caretaker for a park in the suburban North Richmond with four tennis courts, a pool and three baseball diamonds and it was here the Ashe development his love for tennis. In his childhood he was called as skinny or bones but he grew up to be six feet and one inch tall with a lean build. Spending his early days in the park was the key that developed him as a future athlete. He began to play tennis at the age of six and was instructed by R. Walter “Whirlwind” Johnson, an African- American doctor, who opened his home in the summers to tennis prospects. With Johnson, Ashe learned the sportsmanship qualities that included respect, sharp appearance and no cheating. Ashe went to study at Richmond City Public Schools and received a diploma from Maggie L. Walker High School in 1961. He was a successful junior tennis player in the American Tennis Association (ATA); he was also the first African-American junior to receive a U.S. Lawn Tennis Association (USLTA) national ranking. He also won the National Interscholastics in 1960 and it was the first USLTA national title won by an African-American in the South. The University of California at Los Angeles (UCLA) awarded him a full scholarship in regard of his ability to play tennis so brilliantly. 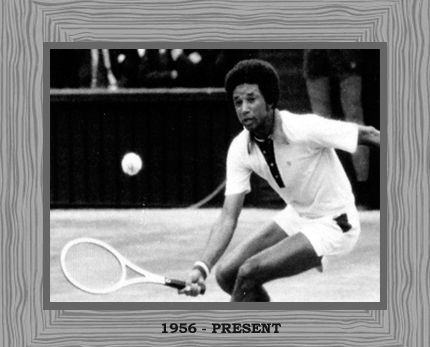 Ashe was the first African-American player to win the U.S. Men’s Hard-court championships, and the first to be named to a U.S. Junior Davis Cup (an international men’s tournament) team in 1963. He also became the National College Athletic Association (NCAA) singles and doubles champion and took UCLA to the NCAA title in 1965. Ashe graduated with a bachelor’s degree in business administration and went to serve in the army. Here too he was assigned time for his tennis competitions. It was in 1968 that Ashe created a tennis program for U.S. inner cities that was the beginning of today’s U.S. Tennis Association/National Junior Tennis League program. In the late 1960’s, two events had a profound effect on Ashe’s life. The first was a protest by African- American athletes at the 1968 Olympic Games in Mexico City, Mexico for being segregated on race in the Republic of South Africa. The second event was tennis as he was the amateur champion of the USLTA and won the first U.S. Open Tennis Championship at Forest Hills. The USLTA ranked him co-number one (with Rod Laver). After this, he reached the top and turned a professional tennis player in 1969. He also helped to found the Association of Tennis Professionals (ATP) in 1972. Ashe was the first African-American to reach the South African Open finals that were held in Johannesburg, South Africa and won the doubles with Tom Okker of the Netherlands. He was given the name “Sipho,”by black South Africans that means “a gift from God” in Zulu. 1975 was the best year for Ashe and his most consistent season as he went on to win men’s singles title at Wimbledon, beating Jimmy Connors. Ashe was ranked number one in the world and was named ATP Player of the Year. In 1979, Ashe was playing the master finals in New York when he suffered a heart attack that ended his career. After his heart surgery, Ashe announced his retirement from tennis. However, retirement from competitive tennis did not take Ashe away from the game. He served as the captain of the U.S. Davis Cup team and led it to consecutive victories. Ashe remained in the limelight for his Davis Cup campaigns, protests against apartheid in South Africa and call for higher educational standards for all athletes. He spent his time dealing with people by writing, speaking, teaching, business and public service. He helped to develop the ABC Cities program, combining tennis and academics; the Safe Passage Foundation for poor children that includes tennis training; the Athletes Career Connection and the Black Tennis & Sports Foundation, to assist minority athletes and 15-Love, a substance abuse program. He was elected to the UCLA Sports Hall of Fame, the Virginia Sports Hall of Fame, and the Eastern Tennis Association Hall of Fame. He became the first person named to the U.S. Professional Tennis Association Hall of Fame. His book ‘A Hard Road to Glory: A History of the African-American Athlete’, was published in 1988 and he won an Emmy Award for writing a television version of his work. In 1988, Ashe was diagnosed with HIV virus caused due to a blood transfusion in his second heart surgery. After this discovery, he founded the Arthur Ashe Foundation for the Defeat of AIDS to provide treatment to AIDS patients and to promote AIDS research throughout the world. He died in February 1993 in New York City after fighting with his disease. Even though he had been a sportsman all his life, yet he became a legend for his efforts to promote human rights, education and public health.